Two-time Oscar winner, Alexander Payne, and writer/producer of Sammy Davis Jr.: I’ve Gotta Be Me, Laurence Maslon, will be Tom Needham’s guests on WUSB’s The Sounds of Film. 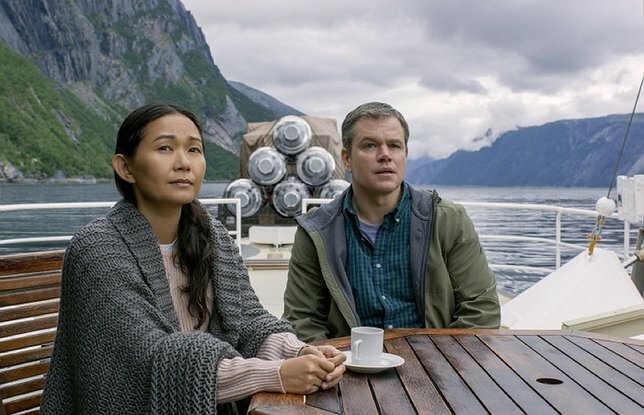 Paramount’s ‘Downsizing’ starring Hong Chau and Matt Damon. Stony Brook, NY - March 21, 2018 - Legendary two-time Academy Award winner, Alexander Payne, will be Tom Needham’s exclusive guest this Thursday at 6 P.M. on WUSB’s ‘The Sounds of Film.’ The celebrated director will be talking about his ambitious new comedy, ‘Downsiding.’ Also on the program is the writer/producer of American Masters’ ‘Sammy Davis Jr.: I’ve Gotta Be Me,’ Laurence Maslon. Writer/director, Alexander Payne, will be speaking to Tom Needham about his latest original comedy , ‘Downsizing,’ starring Matt Damon, Kristen Wiig, Academy Award winner, Christoph Waltz and Golden Globe nominee, Hong Chau. The movie tells the story of Paul Safranek (Matt Damon)and his wife Audrey (Kristen Wiig) who decide to ditch their stressed out lives by getting a shrinking procedure made possible by scientists in order to live large in a luxurious downsized community. ‘Downsizing’ imagines what would actually happen if people could downsize in order to combat overpopulation. When Paul goes through with the downsizing procedure, he only begins his search for deeper meaning in life. Alexander Payne is one of America’s most esteemed writer/directors. He is known for his films ‘Citizen Ruth,’ ‘Election,’ ‘Sideways,’ ‘The Descendants,’ and ‘Nebraska.’ He is a two-time winner of the Academy Award for Best Adapted Screenplay, and a three-time nominee of the Academy Award for Best Director. In 1995, Payne’s film ‘Sideways’ won the Golden Globe Award for Best Motion Picture. Also on ‘The Sounds of Film’ is the writer and producer of American Masters’ ‘Sammy Davis Jr.: I’ve Gotta Be Me,’ Laurence Maslon. His movie is the first major documentary to examine Davis’ incredibly diverse and successful career. The film documents Davis’ incredible journey in show business during a time of racial prejudice and political change in America. The movies features fascinating interviews with Billy Crystal, Norman Lear and Jerry Lewis. Laurence Maslon will also be joining Tom Needham for a Q & A at the Port Jefferson Documentary Series’ screening of ‘Sammy Davis Jr.: I’ve Gotta Be Me’ on Monday, March 26th at 7:00 PM at the Long Island Museum in Stony Brook. For more information, visit wwwportjeffersondocumentaryseries.com. The Sounds of Film is the nation’s longest running film and music themed radio show. For the past 30 years, the program has delivered a popular mix of interviews and music to listeners all over Long Island, parts of Connecticut and streaming live worldwide on the internet. Past interviewees include Alec Baldwin, Bob Geldof, Kenneth Lonergan, Wallace Shawn, writer Chris Hedges, William H. Macy, DA Pennebaker, composers Kim and Kathryn Kluge, composer Rolfe Kent, and Jim Breuer. Subject: LongIsland.com - Your Name sent you Article details of "Oscar Winner, Alexander Payne, Talks ‘Downsizing’ on Tom Needham’s ‘The Sounds of Film’"